Summary: We need to rethink what we should be doing about Trident, given the recent embarrassing failure. The choice need not be between scrapping Trident and replacing it with a new system at very great expense. The third possibility is to make do with the current system. It only needs to be kept running at a level that makes it a plausible deterrent. This would be dramatically cheaper than building a new submarine system when so many in the UK military feel it is simply not a sensible thing to do. Calls to scrap Trident altogether or to replace it at great cost ignore the possibility of extending the life of the current Vanguard class Trident submarines. Their design is based on the US Ohio design but the boats were manufactured in the UK. Although designed with a 25 year lifetime there is no good reason why the Royal Navy cannot simply make do and mend, replacing any components that cause serious safety concerns. The US replacement programme has their new submarines entering service 50 years after the Ohio class vessels entered service. The Trident missiles are not British owned but leased from the US where they are routinely refurbished and repaired. These missiles will continue to be used by the US replacement submarines. Unfortunately, the recent failure during a test firing is very concerning. UK submarines have test fired around 10 missiles over the last 20 years. 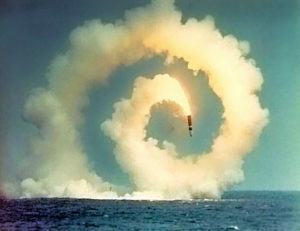 The manufacturers of the missiles, Lockheed Martin, claim very large numbers of firings without incident although the above image, of a Trident II(D5) missile being fired doesn’t look completely right. No doubt government press officers will explain how that might be completely normal. Another Trident malfunction in mid-2015 can be seen at: www.youtube.com/watch?v=1xLmB81v-BI . Trident continues to be reasonably popular with the public and politicians. Refurbishing the British submarines would preserve jobs while allowing the decision about a replacement to be delayed. Even in the British military there is increasingly doubt that these Trident systems are militarily relevant. Trident is hardly an independent nuclear deterrent when the missiles are owned and maintained by the US. It is inconceivable that the UK could use these without US knowledge and approval. There is little doubt that keeping the existing Trident fleet going would be a significantly cheaper option in the medium term. Given that there are almost no circumstances under which we might actually use a nuclear weapon it is difficult to see why an entirely new generation of vessels should be procured anyway. The obsession with Trident replacement is another example of a military keen to be ready to fight the last war. Along with aircraft carriers and other large warships, all greatly at risk from a single missile strike, they have little relevance in the 21st-century. Defence money ought to be directed towards both improving cyber warfare capability as well as the development of fast, manoeuvrable unmanned aircraft. These would be cheaper and more capable than the eye-wateringly expensive fighter aircraft still being ordered enthusiastically by the military. Defence policy experts P W Singer & A Cole have written a novel, part fiction and part non-fiction entitled “Ghost Fleet: a Novel of the Next World War” which gives a much more realistic and much more scary idea of what real threats we might have to deal with in the future. Defence policy must start looking much more to the future. We must think through very carefully what the country actually needs to keep us all safe in a rapidly changing world. Can’t do much about that! WordPress is a package that cannot be restructured by innocent users. Internet Explorer is no longer the main Microsoft browser, so will be increasingly forgotten. Nevertheless thank you for your positive comments about the blog! Thank you for your kind words! Tell your friends about Outsidethebubble.net, and more important spread the ideas!